I know my daughter has already done a basic review of the book The Boys In the Boat, but I recently finished this book and it deserves a whole post as well. I have no idea why it took me so long to read this book. My daughter read it, several friends have read it, and readers have read it. Everyone that has read it told me it was a must read, but it took me forever to actually read it. All too often a book does not live up to the hype for me. It is good, but not as good as everyone else thinks it is. Or it is a good book, but just not a book for me. I had this fear with The Boys In the Boat. I was afraid I wouldn’t enjoy it as much as everyone else. But I was wrong. So very wrong. This book was as good as everyone says it is. I loved it! I love to read non-fiction, but the non-fiction books that I love the most are books that read like fiction. The type of non-fiction books that are hard to put down because the story draws you in so much. This book was just that for me. Once I started the book, I could not put it down. I read it in just a few days. I am not really a sports fan. I could really care less about rowing. 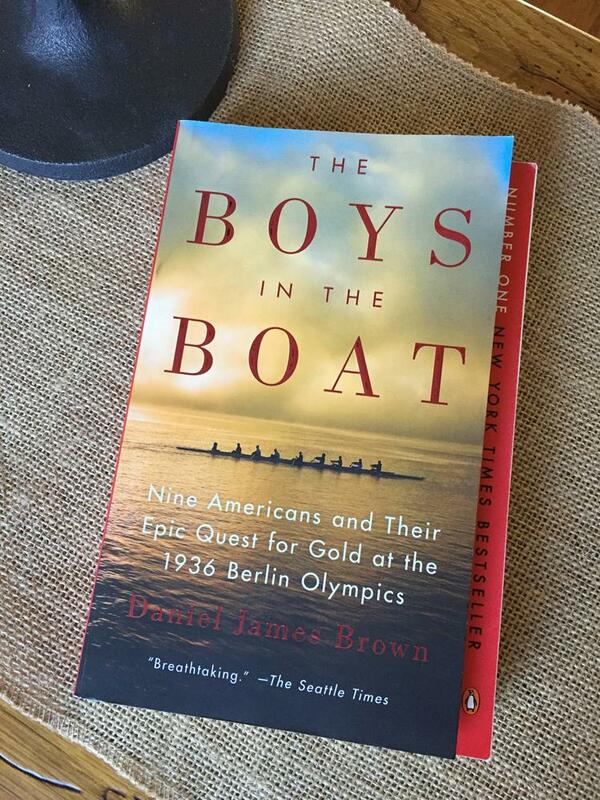 But this book made me care about both the sports side of it and the rowing side. This book is a powerful story of overcoming hardship, difficulty, and not giving up even when you want to give up. It is the story of teamwork and leadership. Both are important character traits to succeed and this book shows examples of both. I also loved that this book was about Washington state. I grew up in Oregon, not Washington, but I know the Pacific Northwest. I grew up in a small logging town in the middle of nowhere, in a somewhat poor area of Oregon. Although I grew up in a totally different generation, in many ways I could relate to the type of men that formed this team. They were rugged hardy loggers, farmers, and shipyard workers that struggled through the nasty weather of the Pacific Northwest to achieve their goal. I also enjoyed that it covered some of the politics of the 1936 Olympics and now I want to read the new book Berlin:1936. I could go on and on about this book. It is only January, but I am sure this will make my list of favorite books of 2018. I know it will rank up their with Unbroken as one of my top ten favorite books of all time. If you haven’t read The Boys In the Boat, I encourage you to read it. I enjoyed this books so much that I think my daughter may have just convinced me to read In the Heart of the Sea, which is by a different author, but a book that she says is just as good.